The 2016 Dodge Ram 3500 is a heavy-duty pickup truck that provides best-in-class towing, innovative tech features, and a stylish cabin. Choose from a variety of body styles and engine options to create the Ram 3500 that speaks to your unique needs. This heavy-duty pickup truck is modern in every imaginable way – so you can count on advanced safety gear and maximum passenger protection. On the road, the Ram 3500 feels smooth and controlled. Choose four-wheel drive for a truly rugged ride. Under the hood, the 2017 Dodge Ram 3500 produces substantial power to meet your hefty towing and hauling needs. 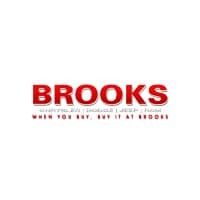 Choose from a range of engine options for the performance you require. To tow max loads, check out the Cummins 6.7-liter turbocharged diesel inline six-cylinder engine. It generates 385 horsepower and 900 pound-feet of torque to help you tow up to 31,210 pounds. With the 6.4-liter V8 engine, you’ll enjoy the benefits of 410 horsepower and 429 pound-feet of torque. Use this engine to tow up to 16,520 pounds. 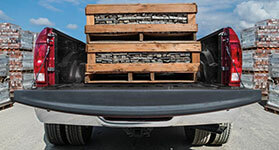 On the road, the Dodge Ram 3500 provides a swift, smooth performance. At highway speeds, the cabin remains peaceful and quiet, making your ride to work a calming experience. Steering is responsive, so you can navigate winding roads and even tight city grids without issue. You’ll also enjoy a comfortable ride. The Ram 3500’s suspension smooths over rough pavement for on-road refinement. Choose four-wheel drive for substantial traction over rugged surfaces, like mud or sand. Choose between three cabin styles: the two-door regular cab, four-door crew cab, and four-door jumbo crew cab. The latter is also known as the Mega Cab, and it’s a great pick for big families and socialites, thanks to its generous rear-seat legroom. Inside, the Ram 3500 supplies refined passenger comfort. High-quality materials and handsome trim make you feel like you’re cruising around in a luxury vehicle. With leather upholstery and heated seats, the Ram 3500 takes comfort to new heights. During the summer months, the ventilated seats keep you cool. You’ll also love the Ram 3500’s tech lineup. 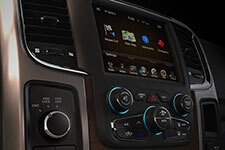 The central Uconnect infotainment system keeps you connected from the highway. Its smartphone integration features give you the power to make hands-free calls and stream music. The voice-control technology comes in handy, letting you access infotainment apps without looking away from traffic. Advanced technology also aims to keep you safe. Use the cargo-area camera to keep an eye on your supplies. The tire-pressure monitor helps you maintain the perfect psi for optimal performance and fuel economy. The Ram 3500 Longhorn Limited is fully loaded with cutting-edge comfort and convenience features. Special leather upholstery, wood trim, and a unique Western style set it apart from the pack. This model treats you to turn-by-turn navigation, so you can explore rugged terrain without a care in the world. Both the front and rear seats are heated to keep passengers cozy during the winter. When you need to move heavy loads, there’s no better truck for the job. Stow, organize, and secure your tools of the trade in this innovative storage box. Modern infotainment options keep you connected on the go. With spacious, supportive seating, your ride to work is always luxurious. If you’re in the market for a heavy-hitting pickup truck, there’s no better option than the 2017 Dodge Ram 3500. It combines substantial towing and hauling power with rich interior comfort. The cabin provides generous head- and legroom, and the plush seating creates long-term support. 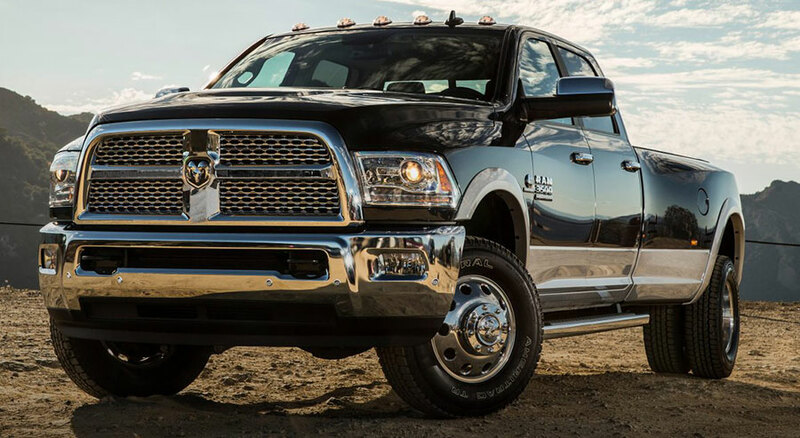 Under the hood, the Ram 3500 generates serious power so you can tow and haul substantial weight. Off-road-friendly performance gear helps you explore rugged territory. Take the Ram 3500 on a test drive today!